This energetic signature is sourced directly from the quantum field and evokes the archetype and first-person experience of the mystic mindset. The Mystic mandala is part of a new line of Ultra-Strength mandalas, which are extraordinarily powerful quantum energy apps. "Opening, opening to the awareness that I am with no boundaries!" "The Mystic somehow relaxes and motivates me spiritually, inner feeling of wanting to grow, explore and expand spiritually is the only feeling I can feel since I started to use this mandala. Using it before sleep, but not during, makes me have many vivid spiritual dreams. The Mystic is very enigmatic and mind opening mandala, I simply love it and its design too. ❤️"
"Meditated about 50 mins with phone + lock. Did the meditation in a dark room. I was amazed at the lights that I began to see with my eyes open as well as shut! Sort of like swirling moving energy. Happened to use the bathroom quickly during the meditation and look at a tree- the tree appeared very trippy looking! I experienced bliss, awe and almost psychedelic like effects!" "I did self reiki session today morning with The Mystic. and the results are amazing. Felt very deeper state of mind. A few times experienced glimpse of bliss of present moment. This is going to be my new favorite for meditation." DISCLAIMER: These results may not occur for everyone. These products are powered by subtle energy, and some individuals may be less sensitive to subtle energy (and to this product as well) than others. That said, this technology and its results are fully amplifiable using easy-to-follow instructions provided on the product download page. And this amplification capacity means that, if you don't experience your desired results in the beginning, you can easily amplify the energy of this product until you finally achieve the results you desire. And if the amplification still doesn't produce the results you're looking for, we offer a pain-free 90-day money-back guarantee should you find that this product does not produce your desired results. Energetic Signature: This signature is sourced directly from the quantum field and evokes the archetype and first-person experience of the mystic mindset. It produces a tangible, altered state of consciousness conducive to spiritual awakening. Mystic (definition) – A person who seeks by contemplation and self-surrender to obtain unity with or absorption into the Deity or the absolute, or who believes in the spiritual apprehension of truths that are beyond the intellect. Open it on your computer, laptop, phone or tablet. As soon as it is opened, it will immediately broadcast quantum vibrational energy patterns to quickly and safely awaken your inner mystic. Use it during meditation, contemplation, prayer, healing sessions, therapy sessions and as often as you like or can comfortably stand. Just open the energetically encoded image file on your computer, laptop, smart phone or tablet. The quantum energy patterns will now be automatically and continuously broadcast through your electronic device! To use on your phone or tablet, just set it as the wallpaper! The energy of this quantum energy app can be amplified to a limited degree on your smart phone and tablet and to an almost unlimited degree on your computer or laptop at no extra cost. This allows you to dial the energy in to exactly the right amplitude for you. What are Quantum Energy Apps (aka "Mandalas")? 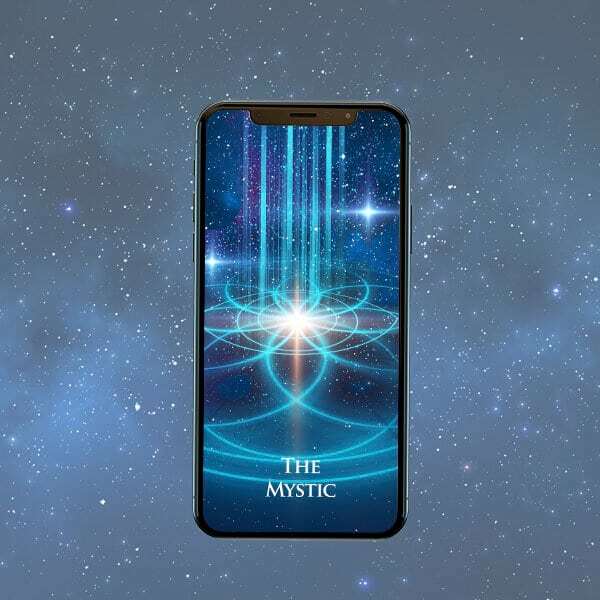 Simply put, our Quantum Energy Apps are energetically encoded digital pictures that transform your electronic devices into powerful tools that support you with energetic frequencies to help you fulfill your goals. These Ultra Strength quantum energy apps are energetically encoded picture files that transform your electronic devices into powerful vibrational tools for healing and personal development. These images do not require the use of sound or audio. Instead, This app operates via subtle energetic vibration and resonance. Just open the energetically encoded image file according to the instructions, which differ depending on what electronic device you use to open the file, and it will automatically broadcast its quantum energy patterns through your electronic device. And there's no need to actually “look” at the image in order for the app to work. Just set it and forget it. It's that simple. Any of the images can be used on any computer, mac, mp3 player, phone or tablet. Want to amplify the energy of the app? No problem! On any computer, laptop or mac, just follow the included instructions, and you can easily amplify the energy as much as you like. Just this feature alone makes this an immense value. Place prints under your seat cushions, pillows and mattress. The energetic signature of the app will travel through all these objects and enter your biofield as you sit and lay on them. Tape a print near or under the power cord to your refrigerator. The energy will travel through the power cord and into all the food in the refrigerator. Place a print under your power strip, and every electrical appliance powered by the strip will carry the wave pattern of the app. Print on both sides of the paper and make multiple prints to stack together. The more copies you stack together, the stronger the energy will be. Still unsure? Don't decide now. Take all the time you need and try it for a full 90 days. If for any reason you're unsatisfied with your experience any time within 90 days of purchase, simply email us, and we'll refund your money immediately after verifying that you tried using the program.